Maybe you started out the school year on the right foot. All those late summer discussions about your kids getting organized, laying their clothes out the night before, getting out of bed on time, fixing their own breakfast, getting through the morning without arguments—you really thought you got through to them. And maybe things went relatively smoothly—for the first few days. But here we are, near the end of the first month back to school, and all those old behaviors are back. Your child might have even added some new annoying behaviors to the mix! The key to a successful morning routine is to know exactly what needs to be done and in what order. Specific tasks and clear systems help everyone stay on track with minimal discussion. You’re starting to resent how much time it takes to pry your child out of bed every day. It’s not even 7 am, and you’ve already had six arguments. You end up late for work several days a week because your child “intentionally-by accident” missed the bus–again. There’s so much eye-rolling, heaving, sighing, and dragging of feet in your morning routine, you’d think it was a sitcom not your actual life. Look, the morning routine is tough on a lot of families. If you’re struggling with this, you are not alone. At Empowering Parents, we hear this every day from parents just like you. Morning wrestling matches—arguments, battles of will, power struggles—happen for every family. The good news is you can turn your mornings around. And although your kids probably won’t thank you for it, everyone will benefit. Here are some practical tips to help mornings go a little more smoothly for everyone. Choose one or two behaviors at a time. I bet there are a million things you want your child to do better and not just during the morning routine. The thing is, kids get overwhelmed when you come at them with a long list of things they’re doing wrong. Think of it this way: if your boss comes to your desk and rattles off 16 things you need to improve, you’re not only going to be overwhelmed but also a little annoyed. Don’t you do anything right?Give your child a chance to gain skills and confidence by focusing on one or two behaviors that need to change. Choose the top two annoying morning behaviors, and come up with a specific action plan to address those issues. Talk with your child about the things they can do to improve those one or two things, and help them come up with ways they can meet your expectations. To see real changes, be specific. It’s not enough to tell your child, “You need to remember your homework.” Your child needs to know exactly what she can do differently in order to remember her homework. To help her build organizational skills, think specific action steps rather than vague directions. Talk through some ideas together. If there are things she can do the night before to prepare for the morning, make sure those are clear. The key to a successful morning routine is to know exactly what needs to be done and in what order. Specific tasks and clear systems help everyone stay on track with minimal discussion. Coach your child, then step out of the picture. So many parents work way harder than their kids do: waking your child up five times every morning, reminding them every ten minutes that they need to make their lunch or pack up their gym bag. The good news is, you can stop working so hard. It isn’t working anyway. If you’ve had a clear discussion about your rules and expectations for the morning routine, all you need to do in the morning is remind your child of the rules. In the beginning, you may need to do some coaching, but resist that urge to jump in and do the work for him. Let the school enforce consequences. Your child’s school has rules and expectations for their students. Most likely, there are consequences in place for students who don’t meet those expectations. This is a great opportunity for you to step out of the drama and allow someone else to enforce the rules.If your child habitually shows up late, don’t protect them from detention or other consequences. If your child brings up a last minute homework assignment, don’t fix it. Let him deal with the consequences from his teacher. This is a tough one for some parents, but it shows your child that there are natural consequences for their actions.Remember, your child is the one who needs to work harder at getting to school on time or finishing their assignments on time. As James says, you’ve been through all this in your own childhood—you don’t need to do it all again. How does this work in practice? If your child springs last minute homework on you in the morning, you might let her know: “Homework gets done after school, not before school. You’ll need to tell your teacher that you haven’t finished it.” Keep your child responsible for their own actions and the results of those actions. James calls this a “culture of accountability,” and it’s a key part of a healthy family system. No matter what happens, step away from the arguments. There’s no good time to get into an argument with your child, but the early hours of the day are definitely not a good time. No one needs extra drama in the morning, especially not you. Instead of getting into daily morning arguments, remind your child of the rules, give them a little bit of coaching, and step out of the way. Arguments only delay things that are already taking far too long. If your morning struggles go beyond average annoying behaviors, be sure to reach out for more help. Kids with ODD and other challenges may need more specialized coaching to help them improve their behaviors. And know that the entire Empowering Parents team is here to help you. So remember to stay clear and consistent, coaching your child rather than engaging in battles of will. As James says, you don’t have to attend every argument you’re invited to. This is especially true in those short morning hours before your work day begins. 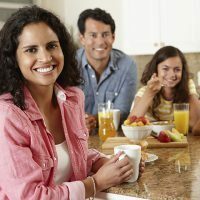 With time and practice, your family’s mornings can be a lot less stressful.